Variant Configuration. When replacing a module on a Vauxhall car, it is common for the module to be capable of covering many different options such as cars fitted with or without rain sensor, with or without cruise control, hatchback, saloon or estate etc. It's essential the module is configured with the correct options for the particular car it is fitted to otherwise it will not function correctly. In VAUX-COM this involves selecting present or not present on each setting, and choosing program to set the changes. DTC Fault Code screen. 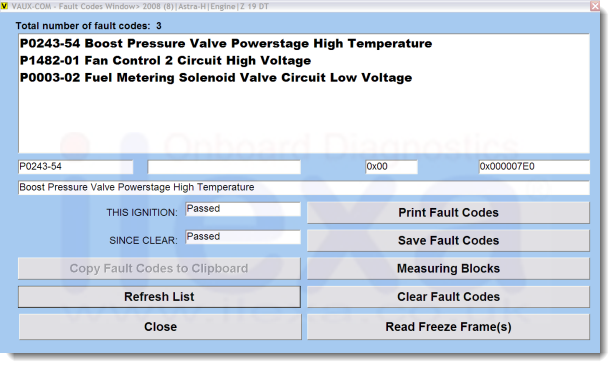 From this screen fault codes can be saved, printed, cleared and reviewed. Full details of each code is displayed, including the current status, showing whether the code is present now, or was recorded earlier. Also, for many codes there can be extra detail shown as 2 extra characters after the main fault code. VAUX-COM automatically decodes and displays these elaborations so you get the full text with nothing missing.